The day went by with everybody saying goodbye, crying, thanking each other, packing and departing. We took the last chance to capture everybody on camera. Unfortunately, those who left early are not in the pictures. The results are now available! 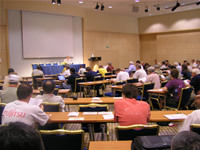 During the first half hour of the contest the students who had questions concerning the problem statements were allowed to ask their leaders in Portorož for clarification. This was done electronically over the Internet. 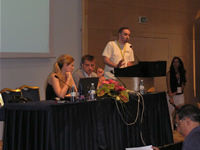 The leaders presented the question to the jury, who formulated an answer which was then sent back to the contestant in Ljubljana. 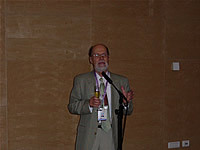 The leaders and the contestants gathered in Ljubljana today for the grand opening of IMO 2006. In an interesting set-up they all filled the same hall, but did not meet face to face as the leaders were on another floor. The guest speakers at the opening were the Chairman of the Organizing Committee, Mr Zvonko Trontelj, the Mayoress of Ljubljana, Ms Danica Simšič, the Minister of Education and Sports, Mr Milan Zver, and the Chairman of the IMO Advisory Board, Mr Jozsef Pelikan. 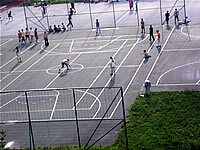 In the morning many engaged in sport activities as the Sport Games will be held on Thursday. Slovenian, Bangladesh, Chinese, Japanese and Czech representatives were interviewed. 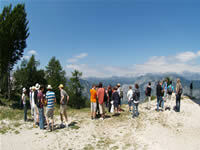 The Canadian team landed at Brnik Airport in the early afternoon, and were accommodated in beautiful Bohinj. In the evening they were joined by the Swedish and the Luxembourg team. The British team, who are at Bled, have now been joined by their group leader and an observer. 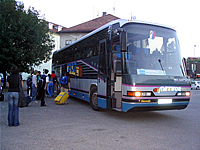 Yesterday afternoon the first international team, the British, arrived in Slovenia, which unofficially marked the start of IMO2006. 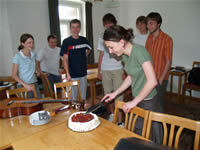 The Slovenian team arrived at Bled to engage in a set of preparations for IMO2006. There they were greeted by the chairman of the organizing committee and a Wolfram Research representative. Each contestant was given a free copy of Wolfram's Mathematica package, which can be of great aid in solving mathematical problems. Registration of participants is almost completed. 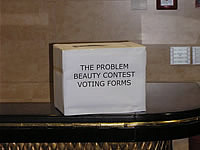 See the current list of registered participants. The participants from countries needing visas should be registered through our server as soon as possible as the process of visa acquisition can start only after the participants have been registered. Registration of participants is in progress. 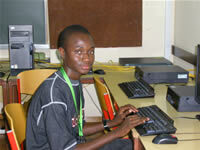 Note that April 30, 2006 is the last day for on-line registration of Leaders, Deputy leaders and Observers. The official invitation to the 47th IMO has been sent today by regular mail to the countries for which we have received (see the list) the fulfilled Contact Form (PDF). The official invitation to the 47th IMO will be sent in November 2005 to the countries for which we have received (see the list) the fulfilled Contact Form (PDF). 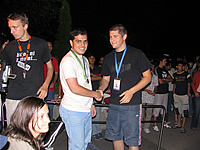 At 46th International Mathematical Olympiad, which was held in Merida, Mexico, from July 8 to July 19, 2005, Gašper Zadnik (Gimnazija Vič, Ljubljana) received a silver medal, David Gajser (II. gimnazija Maribor) and Špela Špenko (Gimnazija Bežigrad, Ljubljana) have received honourable mentions. 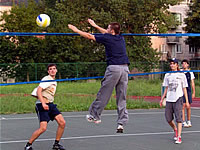 Slovenian IMO 2005 Team consists of: Matjaž Berčič (Gimnazija Škofja Loka), David Gajser (II. gimnazija Maribor), Urban Jezernik (I. gimnazija v Celju), Sara Kališnik (ŠC Celje - Splošna in strokovna gimnazija Lava), Špela Špenko (Gimnazija Bežigrad, Ljubljana) in Gašper Zadnik (Gimnazija Vič, Ljubljana). 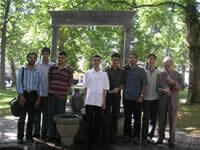 Webpage for the 47th International Mathematical Olympiad in Slovenia, 2006, has been put online.